Every year the Ellen show an episode called Last Minute Costumes. 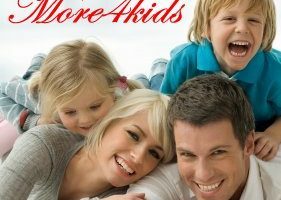 The kids and I love watching it when it comes out and it gives is some fun ideas. Here are some of the shows from 2010 to 2014. 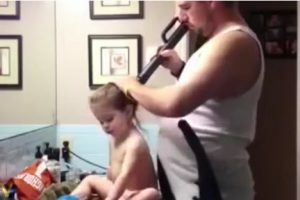 What will your kids be this year? Maybe this will give you some ideas. This episode was totally adorable as kids show off their costumes to Ellen. Some of the costumes include Tyler dressed up as a bed bug, another Tyler, 7 year old playing a miner from Chilis. Isabella was a little political this year and dressed up as the ‘Tea Party’. Ellen brings out 7 year old Sara and gives her an iron, turning her from a Chef into the Iron Chef lol. A group of adorable kids dropped by to collect some candy, and Ellen couldn’t resist helping them with their costumes. If you’ve seen a hilarious Halloween costume, send it to us right here! My Favorite is Money Balls where in the end they roll this little boy away!! In 2012 Halloween Costumes includes 6 year old Clint Eastwood, 6 year old Cecelia as a chair, Steven, a totally adorable musician who Ellen rips off his shirt and he becomes magic Mike, and little boy with a racetrack around him as the ‘presidential race’ and finally 5 year old little boy in a spaceship with a doggie costume as a Mars Rover!! lol. Love this years kids. There are many cute kids in this episode, including a cute ‘recking ball’, a scary Nora as an iphone 5, 5 year old Sophia as a compass, a totally adorable 7 year old Evelyn as Mount Rushmore finally 6 year old Jennifer as Miley Cyrus’ tongue! This was a great year for Last Minute Halloween Costumes. 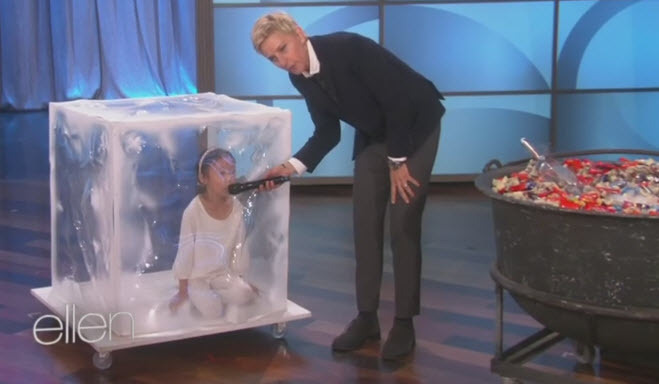 Ellen had some great kids and costumes this year including a little girl inside an ice cube. When Ellen asked Lauren what she was she said ‘Frozen’! What will 2015 bring? We can’t wait.